The Planning and Zoning Department is a one-stop shop for your building and development needs in Auburn. From concept to construction, plan review to permitting, and inspection to occupancy, we are here to serve and eager to please. The department has a real-world, common sense approach to its interpretation of codes and ordinances. We all want to help resolve situations and offer alternatives. Customer service is priority number one. Your success is our goal. In addition to working with the public, planning staff work closely with the Planning Commission and Board of Appeals. 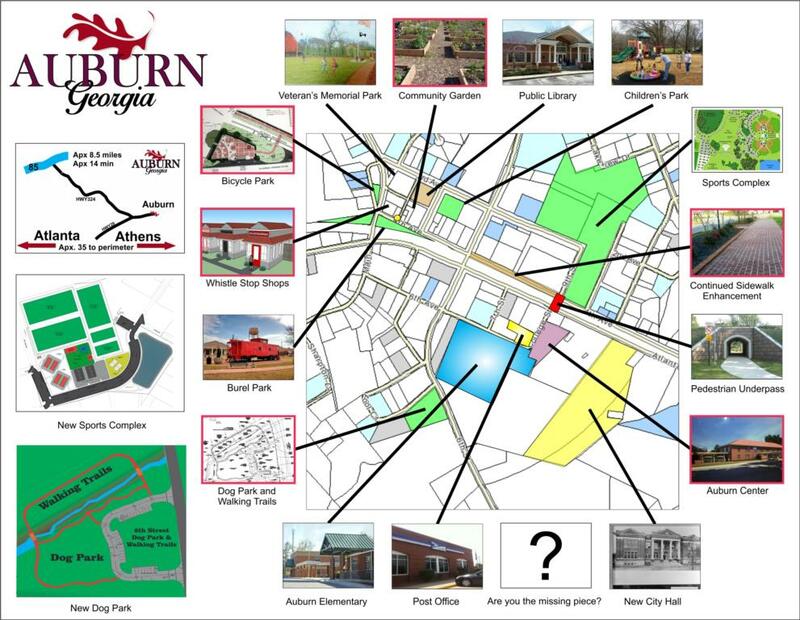 Planning and Zoning staff work closely with the Auburn Downtown Development Authority, the Barrow County Chamber, the Gwinnett Chamber, and the Atlanta Regional Commission in promoting the city. Adopted every four years by the mayor and council, the Comprehensive Plan serves as the official long-range policy for guiding future decisions concerning land use, zoning, and public facilities for the City of Auburn. Check out the Community Garden, Whistlestop Shops, and Fourth Avenue Streetscape projects.